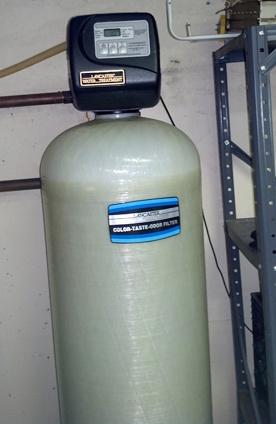 We provide Water Filter, Water Softener, Water Purifier, Water Filtration & Treatment in North & Central Jersey (Union County & Somerset County NJ, and parts of Essex, Morris & Middlesex County NJ). Our Water Treatment technicians are company employees (no subcontractors), and have the skill and expertise to provide you with the best Water Purification products and service available to our Residential and Commercial clients. A Water Filter System can improve the quality and safety of your water, remove rust stains, prolong the life of your pipes and appliance, and more. And a Water Softener can be necessary to help protect your faucets and fixtures from calcium build up. We provide water softener equipment from high quality manufacturers such as ProSystems Water, and we also service existing water softeners. Water Treatment can address many water quality problems, including low pH (which can cause blue-green stains on plumbing fixtures), high iron and manganese (which can cause orange or black stains on clothes, sinks and toilets), hard water (which can leave your skin and hair dry, and leave spots on glass and silverware), water odors (chlorine, rotten egg smell, etc. ), bad taste, bacteria, and more. Some of the Water Treatment products we provide include Water Softeners, Water Filters, Ultraviolet (UV) Disinfection, Acid Neutralizers, Sediment Filters, Carbon Filters, Reverse Osmosis, and more.